TABASCO® brand Chipotle Pepper Sauce --- 1-3/4 oz. Cider vinegar --- 1-3/4 oz. Make a brine for the chicken wings: In a large pan, place water, sea salt, muscovado sugar and herbs; bring to a boil, then let cool. Once the brine has cooled, transfer to a bowl and add the chicken wings. Refrigerate 2 hours. Prepare a barbecue for smoking, setting temperature to a low heat, about 225ºF. Remove chicken wings from brine and dry thoroughly. Place wings on barbecue and close lid. Smoke wings for 1 hour, checking after 30 minutes and turning over if needed. Cook to an internal temperature of 160ºF; remove cooked wings from barbecue and allow to rest. 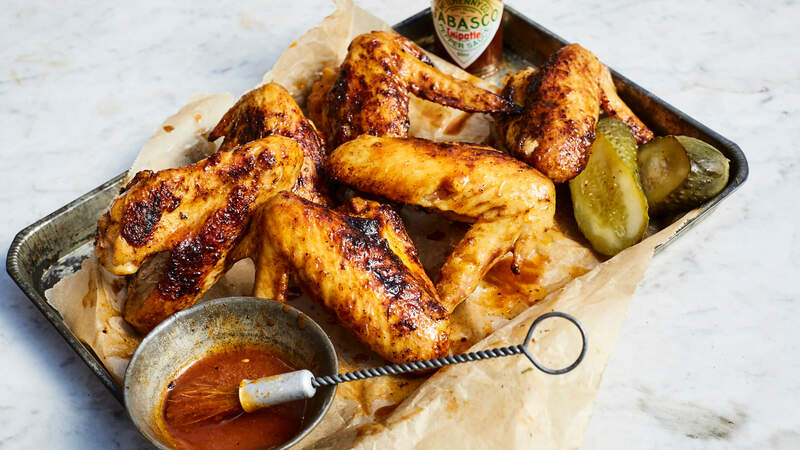 While wings are resting, make a wing sauce: In a pan, place TABASCO® Chipotle Sauce, cider vinegar and butter; heat gently and whisk together until the sauce emulsifies. To finish chicken wings, increase the temperature of the barbecue to around 575ºF and grill wings until slightly charred. (If short on time, you may simply grill the wings without smoking them first.) Glaze wings with wing sauce and add a squeeze of fresh lemon juice. Transfer wings to a plate and coat in more wing sauce, then serve with pickled gherkins on the side.